On Wednesday 18th June, the Smiley store was transformed as DJ Park took over and gave budding DJ’s lessons and tips on how to make it in the industry. Decks were spinning, tunes were playing and drinks were flowing as crowds flocked to Boxpark on this sunny evening to be part of a new concept music event and get involved in the DJ scene. DJ Park are seasoned DJ’s and have been arranging pop-up events across London this summer to spread the word about DJ-ing, perform multiple mixing sessions and help people who are keen to learn the trade and be part of the next DJ generation. With Smiley’s links to dance music and DJ’s, its a great initiative that we are only too happy to get involved with! Despite having an unbelievably successful 12 months that included his band RUDIMENTAL topping the UK charts and even winning a Brit Award for “Best Single of the Year”, that didn’t stop Amir Amor from pulling a sad face for the Smiley cam. 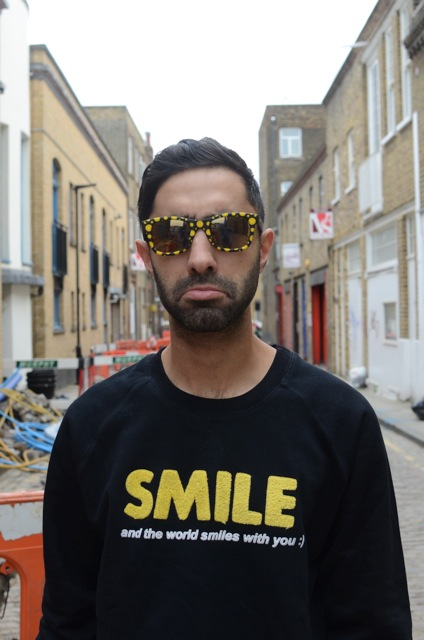 We hope that his Pony X Smiley sweatshirt and Smiley sunglasses cheered him up a little! WALES International Joe Ledley on the other hand looked extremely Smiley in his mesh tee shirt. It’s difficult to expect anything other than happiness after the goalscoring midfielder played a huge part in CRYSTAL PALACE’S spectacular end to the Premier League season. Palace hauled themselves from the foot of the EPL to mid table safety with wins against Chelsea and an amazing comeback against Liverpool. Keep your eyes peeled for a host of other celebrities wearing Smiley in the coming months. Smiley London launches SS14 collection! Smiley launched its Smiley London Spring Summer 2014 collection on Thursday 6th March with an exclusive bloggers event at the brands flagship Boxpark store in Shoreditch. This hipsters showcase was attended by some of London’s most Influential fashion, lifestyle & music bloggers who were treated to an evening of Balearic beats, ice cold beers, goodie bags and some of the seasons hottest trends showcased in the new range that features; aertex, camouflage, tie dye, animal and Hawaiian prints on a summery colour palette of neon reds, ocean blue and aqua greens. Both the launch event and the new SS14 collection takes influence from over two decades of block rocking beats, unforgettable raves and the unique fashions that keep London and Smiley at the forefront of global street culture. With the weather warming up in London this weekend, we can’t wait to get out and rock the new collection. Smiley “Happy Sports” launches in China at ISPO Beijing! With the trade show season nearing its climax, globetrotting Smiley CEO Nicolas Loufrani was in China launching Smiley “Happy Sports” to the local press and buying community. As ever the Smiley crew was in full effect, spreading happiness and pinning trademark Smiley badges to all passers by. Smiley “Happy Sports” seems to be going down a storm on both sides of the planet for 2014. Keep your eyes peeled for the products launch to market in August 2014. Smiley is proud to have continued its long-standing tradition of keeping a ‘Smile is always in style’ on the runway at this seasons Madrid Fashion Week. The second collection between the two fashion houses showcased on the runway last night to critical acclaim from celebrities and key media. The collection, aptly named ‘Run Baby Run’, was influenced by a sports-luxe theme. Pieces included jersey separates in autumnal black, brown and burnt orange with highlights of red, which featured the iconic smiley face throughout. The current SS13 Carlos Diez and Smiley collection will be available on www.carlosdiezdiez.com from March. Smiley says “goodbye summer” @ Space Ibiza! After collaborating on a t shirt capsule collection together Smiley once again parties with the best if them…..! The date Sunday 6th of October,the place Space Ibiza, smiley partied all day and through the night till sunrise celebrating with the best DJ’s in the world and thousands of the coolest party people. The famous Space Ibiza closing party every October is the night to celebrate the end of the hedonistic Ibiza party season: a symbolic spiritual gathering where all party lovers gather to say farewell to the end of the summer. Nicolas Loufrani and Pepe Rossello, have been grooving with Carl Cox, Luciano, Ritchie Hawtin, Paco Osuna, Dj Luciano and many other super djs all night long, in the name of fashion, music and happiness. Discover Smiley philosophy and products here. Italian DJ Francesco Rossi wins “best track of the season” award @ 2013 DJ Awards in Ibiza! Congratulations from all Smiley Team to Francesco Rossi, the winner of 2013 DJ Awards held last night at Pacha In Ibiza! The Italian DJ has won the award for “best track of the season” with his track “Paper Aeroplane”. Enter your email address to follow the Happiness & receive notifications of new posts by email!